If you’re looking for the best that TV can offer, then Sky is the ultimate choice for variety and ease of use. All new customers receive the superb Sky Q box system that means you only have one box wired to your satellite dish and other “mini boxes” link via your home wi-fi system. The entry level package starts at just £22 per month. You can view, buy, and upgrade your account 24 hours a day seven days a week. If you need any help at all, then please contact our experts who can help you choose. So who else can you choose if you don’t want to go with Sky? Freeview offers 80 free-to-air channels directly via your smart TV at no additional cost. Freesat provides the same channels via an existing satellite dish. You’ll need a decoder, or box, to accept and decode the signal. BT (British Telecom) have heavily invested in their TV and include the BT Sports free for the first 12 months. TalkTalk has entered the market with a limited offering. Poor customer services and a 24-month contract could put people off opting for this provider. 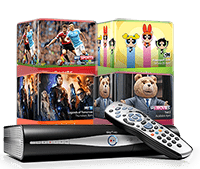 Virgin Media bundle all channels including Sky and BT with their cable broadband services. You can only receive the product if you have Virgin cable in your street. Now TV is Sky’s on-demand service with monthly contracts. With so much choice around, how do you choose the service best for your circumstance? Our guide below should help you through the minefield. Will I need on-demand or catch-up services? If so, you’ll need a fast broadband connection. Are the sports channels required? What about the kid’s channels such as Disney or Nickelodeon? Do you need to watch TV in more than one room? How about the requirement to pause live broadcasts? And don’t forget the thousands of movies available. If you’re a movie buff, then check those offers as well. Each option adds to the monthly cost of any package. The entry-level bundles generally only broadcast free-to-air services with a few proprietary channels such as Sky 1. Sky and BT dominate the pay sports channels. Only BT air the Champions League games with the Premiership split between the two rivals. The table below shows how to access the channels. Tip: It’s worth trying to bundle the sports packages rather than performing a separate upgrade because it works out cheaper. As we already pay the licence fee, the thought of paying even more money may at first seem harsh, especially with the Freeview services available through most modern smart televisions. However, the small monthly cost of the entry-level packages mostly include a broadband connection, line rental and some free calls. Tip: Check the length of your contract as Sky is 18 months and TalkTalk 24 months. Check the channels you’re receiving as well. As mentioned above, you can receive your TV as part of a bundled package that includes everything you need to get online, make free telephone calls and watch your favourite programmes. For most people the basic packages are sufficient. The monthly cost only starts to increase once you start adding the premium channels such as sports and movies. So check our comparison tables to see what deal suits your needs. Call your provider and ask for a deal, you may be surprised by the outcome of the call. Threaten to leave by discussing your account with the retention team. Cancel your account and wait for the offers to come to you. Add in additional services to bundle your package for better value for money. Reducing your channel selection could activate some special deals. Tip: If you’re a Sky customer you’ll receive a discount of 33% immediately after you cancel your account via their app. This discount increases to 50% after three weeks and up to 75% a month after the cancellation takes effect.